Even without elaborate infrastructure, you can still push your data across the network with netrw. If you're looking for a quick and easy tool for transferring files, netrw  offers an elegant solution. According to the project website, the purpose of netrw is to "simplify and speed up file transfers to hosts without an FTP server." Netrw is also useful for scenarios where the user transferring the file does not have an account on the target machine. The netrw project consists of two programs, netread and netwrite. 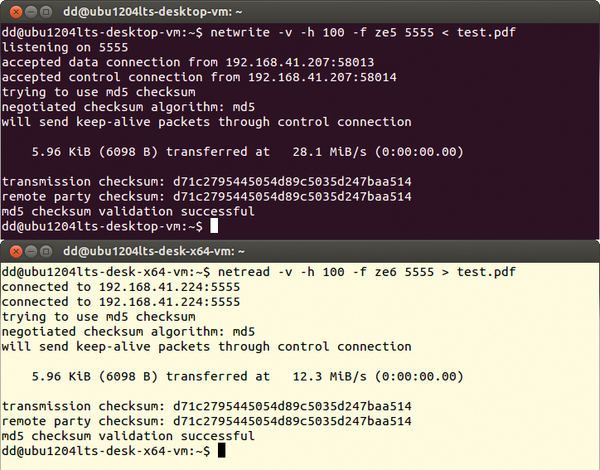 As the names imply, netwrite writes the file from the sending machine and netread reads it on the target. The advantage of this ad hoc solution, compared with solutions in which the daemon listens constantly, is the brief existence of the open channel. This design reduces the likelihood of an attacker accidentally stumbling across the open port. Netrw gives you the ability to transfer any kind of electronic data. Of course, it's always better to use netrw on a protected network, and you are advised not to use it in an insecure setting. If you do, however, you'll want to protect your privacy by encrypting the payload. In the simplest case, start by initializing the reception of data with netread. You only specify the port number and redirect stdout to a file (Listing 1, line 1). The transfer itself is launched in the same style (line 2). Figure 1 shows the transfer sequence. The two programs have common options; the most important ones are described in Table 1. Figure 1: With only a few parameters, you can transfer data using the netread and netwrite tools. You can either redirect the payload directly from a file or you can use the -i <file> option in netwrite. On the target system, use the output redirection (>) or the -o <file> option for saving the data. The progress indicator proves especially useful for transferring large volumes of data; it lets you check to see whether bytes are actually still flowing across the network. You can choose between a display in kilobytes (-h) or megabytes (-H). The option requires you to define the volume of data that triggers a hash mark being written to screen. This can mean that your screen either fills up or shows very little information (Figure 2). Figure 2: Because the progress indicator responds flexibly to a parameter, it is essential to choose a meaningful value for the data volume. In a shell script (Listing 2) , you could use stat  to determine the size of the file and then define a useful integer value for the progress bar. Note that one line is made up of 50 hash marks. Accordingly, you might not see any output for very small volumes of data. The receiving side does not know the file size in advance. You can either ask for this value before the transfer is initiated or use a value of 1000; experience has shown that -H produces reasonable output. Figure 3 shows the flow of the script. For clarity, positional parameters are used in place of input templates. You could extend this script accordingly with the capabilities of Zenity  or cdialog . Firewall mode lets you set up a connection in the reverse direction. You can pass in either the IP address or a hostname using the -f option. The following workflow has proved useful in practical terms: Call netwrite with the -f option, then start netread also with -f. This means that you are using firewall mode on both systems, but the startup sequence is the other way around. In Figure 4, you can see the steps required for the sender (light background in the terminal) and the receiver (dark background). The computers are addressed by their hostnames (ze5 and ZE6). After the call to netwrite, you will see a message that the program is listening on the specified port. The other messages are displayed after calling netread on the target system. Figure 4: Data transmission flow in the firewall mode. Here, the reading side opens the connection after the program has been started on the sending side. Weird data transfer technique avoids all standard security measures.